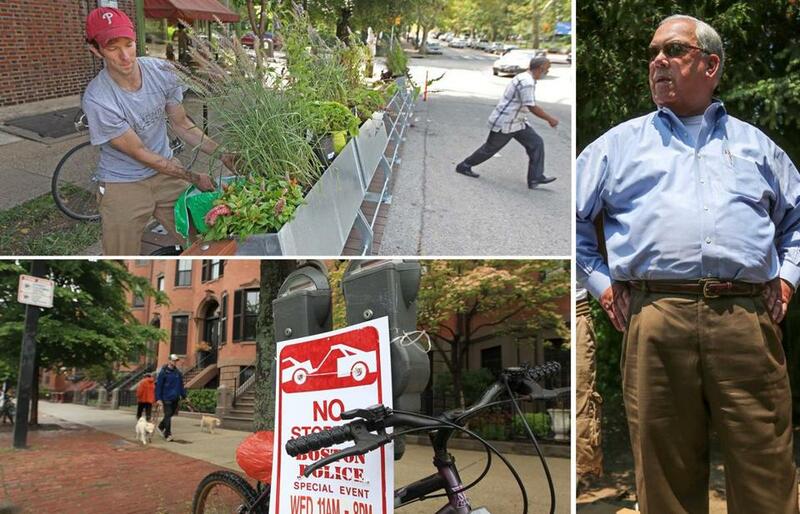 Clockwise from top left: A ‘parklet’ in Philadelphia; Mayor Menino; and no-parking signs in the South End. So I was walking around this fair city over the last couple of days reading, well, parking signs, and though none of the words explicitly said it, their collective message was frighteningly clear: Our mayor has gone off the deep end. Not in a fun way, either, not like, ah, that Tom Menino is such a lovable nut. You see, the signs offered an almost infinite number of reasons why the average driver can’t park on Boston’s streets anymore. There were the usual spaces ­reserved for commercial vehicles, hundreds upon hundreds of them. There were, of course, spaces for taxis. There were entire blocks reserved for tour buses, trolleys, and duck boats. There were spaces for diplomats, for 15-minute parking, for police agencies that I’m not sure exist any more. There were endless spaces for food trucks to park from dawn until long after dark, spaces for electric cars to recharge, for Hubway bicycle racks, for mopeds that apparently don’t exist because they’re never parked there. By my admittedly inexact count, and please don’t hold me to this precise number, there are a grand total of six unrestricted parking spaces remaining on city streets these days, and about 3,000 cars circling the block waiting for them to open up. Funny part is, the owners of the parked cars are sitting in them sending text messages to friends saying they can’t believe the parking space they found. The program turns spaces into “parklets’’ — petite, three-season patios, with benches and planters atop platforms built flush with the sidewalk. And now, in the face of this unprecedented shortage of street parking, our mayor comes along with a stunning new idea. He wants to take the few remaining spaces that we have, install flooring over the pavement, bring in patio furniture and planters, and call them “parklets.” This is terrific. While we’re at it, let’s put a swimming pool on the median strip of the Southeast Expressway and cut the highway down by a lane. Mr. Mayor, we’re going to need you to surrender all sharp objects in your pockets, hand over your belt and shoelaces, and please pay no heed to that surveillance camera pointed at you 24 hours a day. It’s for your own good. Who isn’t pro-parks, but does the mayor really think that every good ­Bostonian wants to grab some Sea & Ski and stretch out amid the fumes of a passing MBTA bus and in the shade of a double-­parked FedEx truck? “The car is no longer king,” Menino once famously said, minus an R or two. At this point in his mayoral reign, the car is barely a serf. 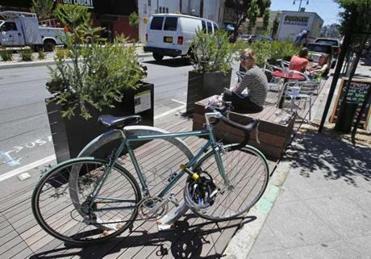 One of 30 parklets in San Francisco, where the concept began. The car is still banned from Downtown Crossing, even while it’s painfully obvious that the hard luck neighborhood would benefit enormously from vehicular traffic. Cities around the country have turned their tired pedestrian malls back into real streets with great success. Not Boston. The car is constantly ticketed. The car is pushed into increasingly narrow lanes to make room for bikes. I have a theory about Menino’s seething disdain for cars, and it can be ­reduced to two simple words: “Police driver.” He has one, a nice plainclothes officer who takes him wherever he needs to be, whenever he needs to be there. He doesn’t have to leave 30 minutes early to search out a space. He never has to pay $34 for three hours on the lowest floor of the Post Office Square garage. He’s never giving a speech while wondering whether he’s going to get a $40 ticket – or get towed. Which gets back to the part about the mayor and the deep end. Not too long ago, I mentioned in print that the mayor probably wanted to set up Foosball games on city curbs. Now I feel the need to let him know it was a joke, not a suggestion. So sage in so many other ways, he’s irrational about cars. What’s next, Hacky Sack tournaments on blocked-off Boylston Street? An Ultimate Frisbee course on Mass. Ave. every Saturday? Stay tuned. The mayor is at war with the car, and the drivers are the collateral damage.